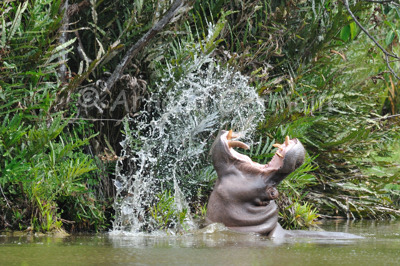 I was visiting Haller Park in Mombasa when I came across a huge enclosure where I could see two hippos in the water. One decided to yawn and do a few threat displays. I quickly shot a series of pictures. The water splash was very impressive! A few years ago, a young hippo and a huge Aldabra tortoise struck a very unlikely friendship in this park. Nikon D700, Sigma 150-500mm OS at 450mm, F6.3, 1/1250s, ISO 1250, Gitzo monopod.